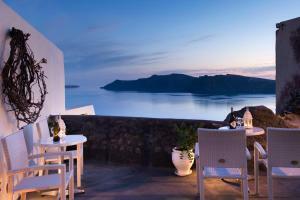 The Enalion, located in the Caldera of Santorini, enjoys a privileged location at 200 meters from the center of Oia. 2 offers shared outdoor hot tubs and suites with traditional furnishings, vaulted ceilings and views of the volcano. Soundproof, cave-style suite with air conditioning, a bedroom, a small kitchenette with a seating area and a flat-screen TV, and a common balcony with views of the volcano and the crater. There is a sofa, towels and linens. 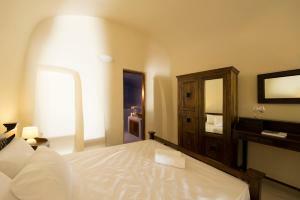 This spacious cave-style suite features a spa bath, a flat-screen TV and free Wi-Fi. It also includes a kitchenette with a dining and seating area and a shared balcony with views of the volcano and the caldera. 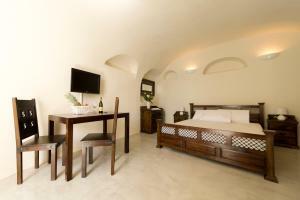 This cave-style suite has a small kitchenette with a dining area. It also includes free Wi-Fi, a flat-screen TV and a shared balcony with views of the volcano and the caldera.